Last week, the House of Representatives passed the most comprehensive childhood cancer legislation ever introduced. The Childhood Cancer STAR Act is expected to be signed into law by President Trump this week. We thank our champions on Capitol Hill for leading the way toward this huge milestone for our community, especially the original sponsors of theChildhood Cancer STAR Act: Senators Jack Reed (RI), Shelley Moore Capito (WV), Chris Van Hollen (MD) and Johnny Isakson (GA) and Representatives Michael McCaul (TX), Jackie Speier (CA), Mike Kelly (PA) and G.K. Butterfield (NC). We also thank each and every one of you who've reached out to your Members of Congress over the past few months -- and years! Every email, tweet, phone call and meeting from the tireless advocates in our community played a part in this monumental victory for our kids. This has been a true collaborative effort with many organizations working together to get us here. We give special recognition to the coalitions of the Alliance for Childhood Cancer and the Coalition Against Childhood Cancer for their leadership. The bipartisan STAR Act is designed to advance pediatric cancer research and child-focused cancer treatments, while also improving childhood cancer surveillance and providing enhanced resources for survivors. This legislation is the result of many years of hard work from our Congressional champions, our community at large, and this organization. Its proposals are grounded in solid data, smart analysis, and a robust roundtable process that achieved community consensus on top policy priorities. What's next? At the Children's Cause, we have already turned our attention to funding, and work is underway to ensure the STAR Act receives the appropriations it needs for implementation. In the coming days and weeks, we'll be asking you to join in that effort. Please continue to follow us onFacebook, Twitter and Instagram for updates and action steps. We are excited to introduce the inaugural class of our College Scholars Program! We congratulate Malachi Thompson and Melissa Peace on their selection as our 2018 College Scholars, among a competitive field of applicants. About the College Scholars Program: Children’s Cause offers an annual opportunity for two childhood cancer survivors to gain valuable cancer advocacy experience. College Scholars, who receive a $2,000 academic scholarship, agree to complete a project of their choosing related to childhood cancer advocacy. About Malachi: At age 6, Malachi Thompson was diagnosed with Acute Myeloid Leukemia (AML). Just months after finishing a year and a half of intensive therapy, he relapsed and was successfully treated with an umbilical cord blood transplant from an unrelated donor. Today, Malachi is a high school graduate with plans to study Aerospace Engineering at the University of Alabama in Huntsville. Malachi has been cancer-free for the past ten years because a transplant saved his life. Now, he wants to give back and encourage others to become bone marrow donors. For his College Scholars project, Malachi will organize a bone marrow drive in his local community in Alabama. About Melissa: Melissa Peace was diagnosed with Non-Hodgkin's Lymphoma her freshman year at Colgate University. Today, Melissa is a medical student at George Washington University's School of Medicine with plans to become a pediatric oncologist. "I want to participate in the College Scholars Program so that I can be an advocate for children with cancer and work to better the field of pediatric oncology research from a legislative perspective," Melissa wrote in her application. As a CCCA College Scholar, Melissa will work to build an advocacy interest group at her medical school, creating a new cohort of informed, engaged voices speaking up to lawmakers about research and healthcare issues that impact children with cancer and survivors. Find out more about Malachi and Melissa and the projects they'll be taking on this summer and fall : Meet Our 2018 College Scholars. Register now for our June 27th webinar "Advocacy Tools and Tactics: How to be the Voice of Change," designed for childhood cancer advocates who want to learn more about effective advocacy practices. We'll hear from several advocates around the country who've been achieving progress around childhood cancer policy issues. This webinar, part of our 2018 Webinar Series, aims to arm you with creative new ideas and impactful tools to take to your own local legislators or statehouse in pursuit of a brighter future for children with cancer. This webinar is being exclusively offered to members of our Kids Action Network, an active and engaged cohort of childhood cancer advocates. Byregistering to participate, you'll automatically become a KAN member. You can opt out of KAN at any time by notifying us at info@childrenscause.org. Registration is now open for the September 13th Patient-Focused Drug Development workshop on chemotherapy-induced hearing loss in pediatrics. If you or someone you know is interested in childhood cancer hearing loss, we hope you'll join us this fall in Hyattsville, MD, just outside of DC. The half-day meeting follows the FDA model for PFDD meetings and will feature a series of facilitated panel and audience discussions, focused on providing the FDA and other stakeholders with patient views on key issues related to burden of the condition, potential treatments, risk-benefit analysis and clinical trials. Visit www.childhoodcancerpfdd.org to register today. We'll keep you posted as details are finalized, including hotel block information, speakers and the full agenda. Join us for Jazz in June! Tickets are now on sale. 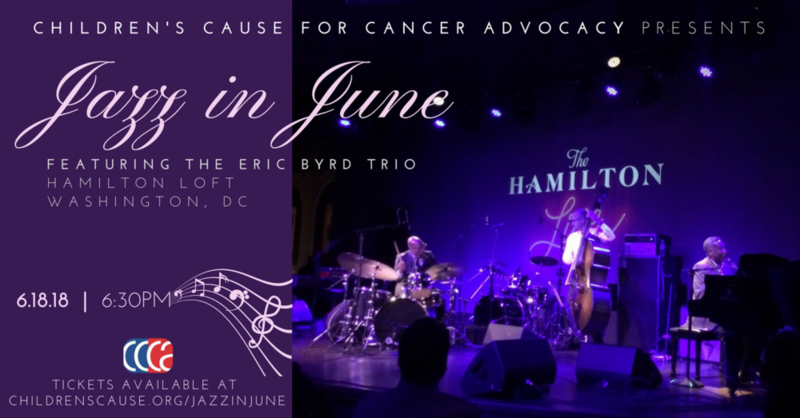 Join us in Washington, DC on June 18th for a reception featuring jazz music from the Eric Byrd Trio! 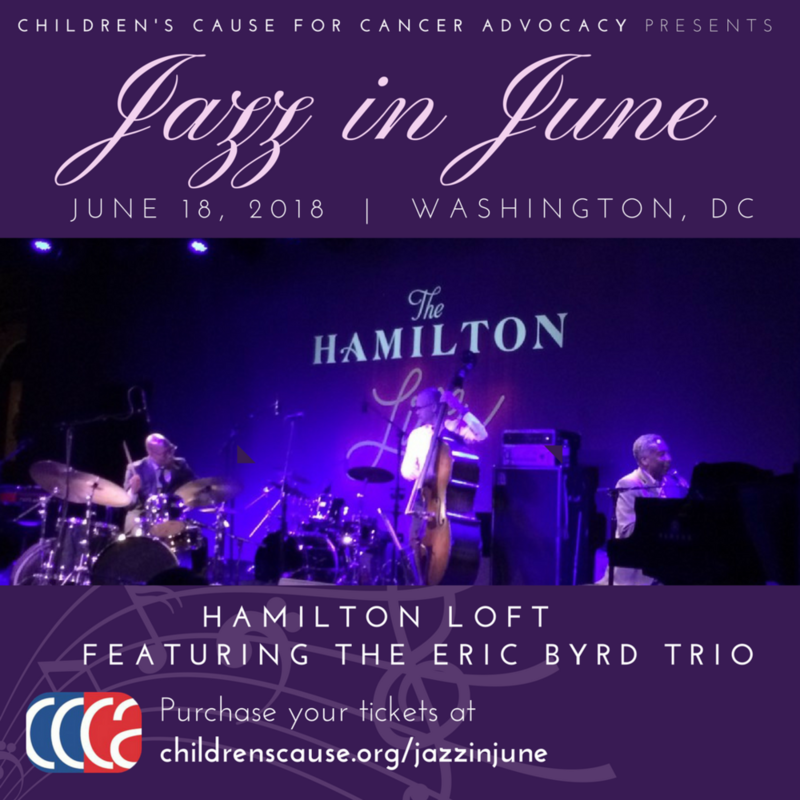 Our Jazz in June event will bring together new and seasoned childhood cancer advocates from 6:30 - 9:00pm at the Hamilton Loft near Metro Center. Tickets are now available, including complimentary admission for childhood cancer survivors. Over 200 advocates from 37 states joined together last week for Childhood Cancer Action Days, hosted by the Alliance for Childhood Cancer. Advocates asked their Representatives to pass the Childhood Cancer STAR Act, which the Senate unanimously passed last month. The Childhood Cancer Survivorship, Treatment, Access and Research (STAR) Act is the most comprehensive childhood cancer legislation ever taken up by Congress. You can still take action from home to back up the impact these advocates had on the Hill. Find out how. Our task now is to get the bill to committee and onto the House floor for a vote, so we can get it signed into law as quickly as possible. Please join in this effort while we have momentum from Action Days! Be sure you're following Children's Cause on Facebook, Twitter and Instagram for the latest on the STAR Act. Thank you for helping us get this bill signed into law. The National Institutes of Health received a $3 billion funding increase as part of a $1.3 trillion appropriations deal passed by Congress last month. This $37 billion budget for NIH represents an 8.8% increase, the biggest percentage increase seen by the NIH in the past 15 years. President Trump signed the FY2018 omnibus into law – but has reportedly been considering a rescission package. Rescission is a process by which the president formally requests (within 45 days of a spending bill’s passage) that Congress backtrack and cut out some of what has already been signed into law. A large and united community of public health and medical advocates spoke up to ensure strong funding for the National Institutes of Health – and now we speak up once again to protect that funding. We’re asking advocates to call, email or tweet their Senators and Representative today and urge them to defend the budget and rebuff any attempt at rescission that would put life-saving research funding at risk. Our action alert makes it quick and easy. President Trump sent his FY2019 budget request to the Hill just days after the FY2018 omnibus passed and - because of the timing - didn't include any of the funding agreements reached in the 2018 budget. Instead, the Administration's budget includes cuts to most of the health programs that children with cancer and their families rely upon. Despite the bipartisan deal by Congress to boost domestic spending to $597 billion, the Trump budget includes only $540 billion in such funding, which puts a squeeze on NIH and NCI. In terms of Medicaid, the budget proposes various policy changes that will negatively impact the health and well-being of children and families who rely on this program. On our blog, we share a sampling of what's at stake for our community. Chemotherapy-induced hearing loss in pediatrics will be the focus of an upcoming Patient Focused Drug Development (PFDD) workshop in Washington, D.C. The Children's Cause, in partnership with other childhood cancer organizations including Mattie Miracle Cancer Foundation and the Children's Brain Tumor Foundation, will host an FDA-approved PFDD meeting on September 13th. The half-day meeting will feature panel presentations by survivors, parents, and medical specialists with an opportunity for public comment and input. This will be a chance for those affected by chemo-induced hearing loss to give the FDA the benefit of their experience. If you're interested in this meeting, please fill out the interest form so we can keep you posted on details and registration. Children and Cancer Forum, May 22: The Atlantic will host its second annual childhood cancer forum at the Newseum on May 22nd from 8-11am. This event brings together physicians, policymakers, activists and health care leaders to examine the state of pediatric cancer care and look towards innovations in the future. Learn more. CAC2 Annual Summit, June 12-14: The Coalition Against Childhood Cancer (CAC2) is hosting its annual Summit and membership meeting from June 12-14th in Seattle, Washington. Learn more. March 2018: BIG victories on Capitol Hill! A Victory for Our Kids: Childhood Cancer STAR Act Passes the Senate! There was huge news on Capitol Hill last week when the U.S. Senate unanimously passed the most comprehensive childhood cancer legislation ever introduced! We thank our champions in the Senate for leading the way toward this huge milestone for our community, especially the original sponsors of the Childhood Cancer STAR Act (S.292), Senators Jack Reed (RI), Shelley Moore Capito (WV), Chris Van Hollen (MD) and Johnny Isakson (GA). We also thank each and every one of you who've reached out to your Members of Congress over the past few months - and years. Every email, tweet, phone call and meeting from the tireless advocates in our community played a part in this milestone victory for our kids. This has been a true collaborative effort with many organizations working together to get us here. We give special recognition to the coalitions of the Alliance for Childhood Cancer and the Coalition Against Childhood Cancer for their leadership. Now, we turn our full attention to the U.S. House, where 362 members are already cosponsors -- over 80 percent! Our task now is to get the bill to committee and onto the House floor for a vote, so we can get it signed into law as quickly as possible. Please join us in this effort by writing to your Representative to ask for their support in getting this life-saving bill across the finish line. This bipartisan legislation is the result of many years of hard work from our Congressional champions, our community at large, and this organization. Its proposals are grounded in solid data, smart analysis, and a robust roundtable process that achieved community consensus on top policy priorities. Thank you for helping us get this bill signed into law. The National Institutes of Health received a $3 billion funding increase as part of a $1.3 trillion appropriations deal passed by Congress last week. This $37 billion budget for NIH represents an 8.8% increase, the biggest percentage increase seen by the NIH in the past 15 years. This boost to medical research funding comes at a critical time, as advances in precision medicine hold the key to more children surviving and thriving after a cancer diagnosis than ever before. The All of Us precision medicine biobank - which includes a pediatric component - received a $60 million increase, to $290 million. The 2,200 page omnibus spending bill also increases the Food and Drug Administration's budget to $5.1 billion (a $483 million increase) and includes $996 million in 21st Century Cures funding. CCCA is pleased to offer an opportunity for two childhood cancer survivors to gain valuable cancer advocacy experience. Award recipients will receive a scholarship of $2,000 via our College Scholars Program beginning in fall 2018. Applicants must be pediatric cancer survivors pursuing a Bachelor's degree or higher willing to commit to a childhood cancer advocacy project of their choosing. Project examples include a summer internship in our DC office or presentation at a health fair or Children's Cause event. The application deadline is April 15, 2018. Scholarship recipients will be notified by May 15. Please find full details and access to the application here. Members of Congress headed home for a scheduled two-week district work period through the first full week of April. If you're interested in meeting with your Congressional representatives about childhood cancer issues - or anything else - these district work periods are ideal times to find your Senators and Representative somewhere near you! If you'd like to meet with your Member of Congress while they're home next week to share your childhood cancer story, here's a good place to start: CCCA's Guide to Congressional District Office Visits. You may also want to check Town Hall Project to see if there is a town hall taking place near you (there are many being scheduled for April 7th). If you do interact with a Member of Congress about a childhood cancer issue, please take a moment to share your experience with us via this Meeting Report form. This information will remain confidential within Children's Cause staff and serves to help us improve our advocacy and refine our own work with these offices. Thank you for taking the time to share your story and our shared cause with lawmakers who have the power to create meaningful change for our kids. 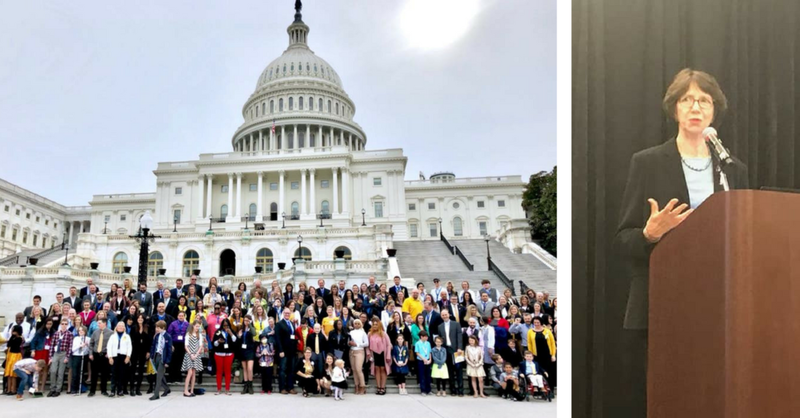 Alliance for Childhood Cancer Action Days, April 23 & 24 -- This annual two-day event brings parents, children, healthcare professionals and others together for new advocate training, issues training, and pre-arranged Capitol Hill visits with Congressional Representatives and their staff. We encourage families, patients and advocates to participate and join Children's Cause in this community event. Find out the schedule of events, hotel information, registration details and reports from previous Action Days on our website. One Voice Against Cancer, May 14 & 15 -- OVAC brings together a wide range of cancer organizations (adult & pediatric) and will be focusing its lobby day efforts around federal funding for research and prevention. If you're interested in being a voice for childhood cancer at this year's event, click here to learn more and register. Take note that the early bird registration rate ends on April 1st! OVAC may still have scholarships available -- please reply to this email with your interest.